Meet Lilian and Benefit Cosmetics! 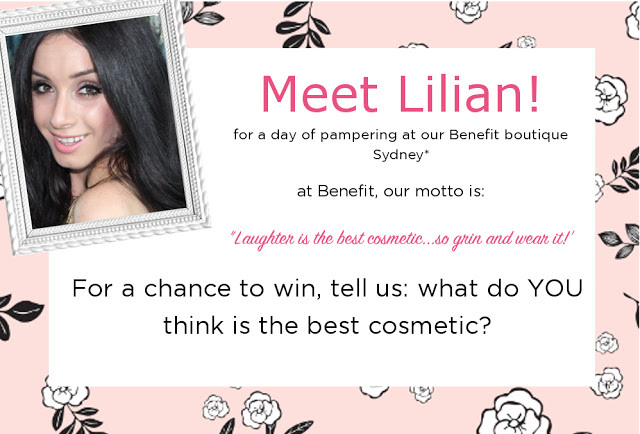 Benefit Cosmetics Australia are inviting FOUR people to hang out with Lilian in the gorgeous Benefit boutique in Paddington, Sydney! Simply like Benefit Cosmetics Australia on Facebook and comment below…what do YOU think is the best cosmetic? Then enter your details for a chance to win! *T&Cs – Competition begins 10/05/13 and ends 19/05/13. Winners will be contacted by email on 20/05/13. The prize is dependent on a date that suits Lilian, the winners and Benefit Cosmetics. Prize cannot be claimed on Saturday or Sundays. Prize expires 02/09/2013. Entrants must be over 15. Open to residents in Australia only. Lilian/Benefit Cosmetics are not responsible for transport to or from the boutique. Ariana Grande Hair & Makeup Tutorial! + Curling Iron GIVEAWAY! Previous PostPrevious Ariana Grande Hair & Makeup Tutorial! + Curling Iron GIVEAWAY! My Everyday Makeup Look / Cosmedicine Review! How To Become Beautiful OVERNIGHT! The best cosmetics make you not only look amazing but feel uplifted too. I love love love Benefit's Hoola Boxed Bronzer. It smells like summer and when I apply it during cold freezing winter it makes me feel like I could be on a tropical island, it also gives my skin a natural sun kissed glow. I frown and wonder what to do. Primer, foundation, redness; be gone! But still the blemish continues on. Of product thick, the hue of rich sand. And banished becomes that little spot! It’s Benefit’s Boi-ing concealer I rate! POREfressional is the best! It's versatile and can be applied under make up or moisturiser or just by itself, and is great for a natural effect! Best primer out there, and though I must say there are MANY other Benefit products I adore (eg Bad Girl mascara and It's Potent eye cream) nothing beats a fantastic primer! I love any of the boxed powders, mainly the blushes, because they're so versatile and such lovely colours! I absolutely love and adore benetint (rose-tinted lip & cheek stain). It is the best cosmetic because it does what it promises, and not a lot of products do that these days! It is a highly valued product on my makeup shelf because it lasts all day and has two benefits (pun intended) in one! Benefit yourself by trying this fantastic cosmetic, you won't regret it. I think in general the best cosmetic is concealer (still looking for an amazing one though). Some days i put some concealer on (gots to cover dem bags) and a bit of mascara and i'm good to go! CONGRATS!! you have become a Winner of the the Benefit & Butterfliielilian Competition! Thank You for entering love, looking forward to meeting you! CONGRATS Love!! you have become a Winner of the the Benefit & Butterfliielilian Competition! Thank You for entering love, Can't wait to meeting you!